The days are just passing by so fast! I can't believe it's Friday again...which only means that the weekend is here. Before I get totally carried away by the wonderful thoughts of weekend, let me first share with you this recipe that's sure to please the meat and potato lover in you! 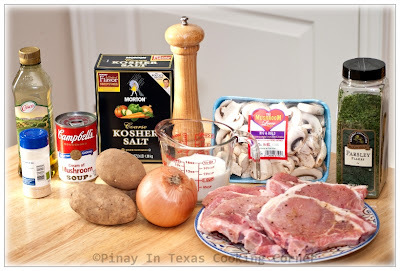 This is simply made of browned potatoes and seasoned pork chops simmered in cream of mushroom soup. This is very easy to put together but the result is very tasty! If you are like us who don't dine out on Valentine's Day if it falls on a weekday, you can make this a part of the lovely three or four course dinner that you'll prepare for your family. 1. 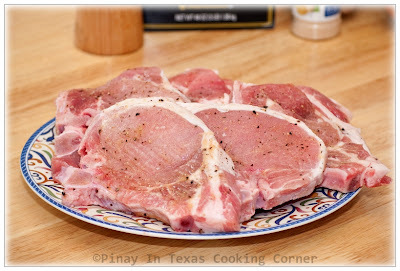 Sprinkle pork chops with garlic powder, salt and pepper. Let sit for at least 30 mins. 2. 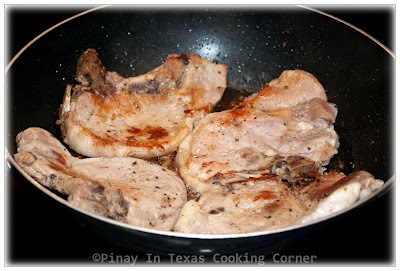 In a pan over medium heat, fry pork chops in olive oil until both sides are light brown. Remove from pan and set aside. 3. 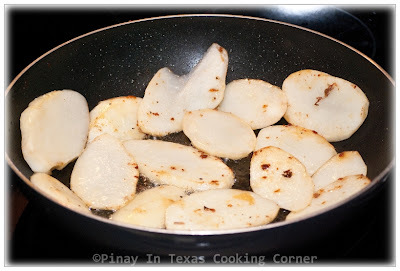 In the same pan, fry potatoes until almost cooked. Remove from pan and set aside. 4. Saute the mushrooms in the same pan until almost cooked. Add onion and saute until translucent. Set aside. 5. 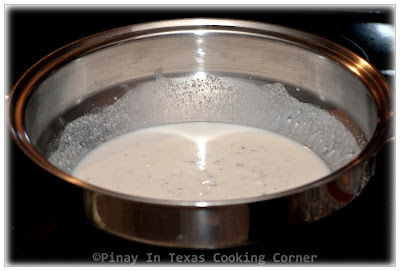 Put cream of mushroom soup, milk and 2 tsps garlic powder in a large sauce pan. Mix well and let simmer for 3 minutes while stirring. Add salt and pepper to suit your taste. 6. Add the pork chops. 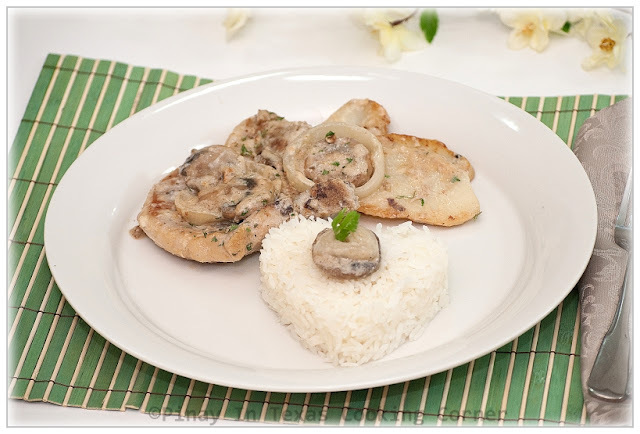 Cover pork chops with mushroom sauce. 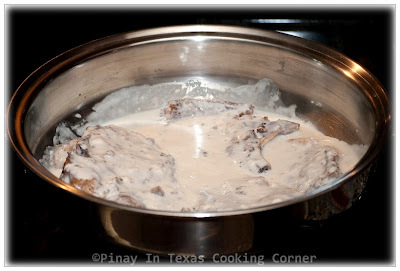 Reduce heat to medium low and simmer until pork chops are tender, about 15 minutes. 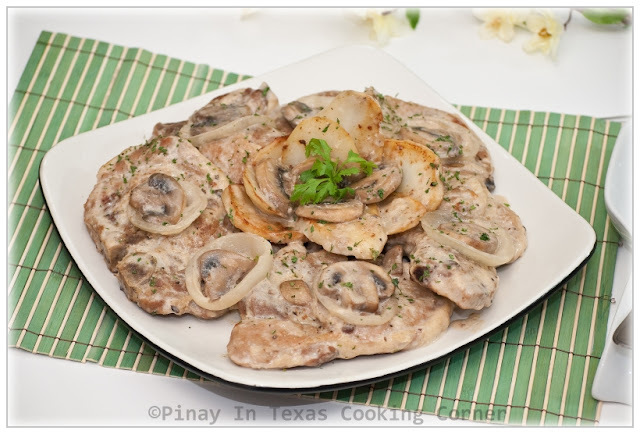 Transfer pork chops to serving plate. 7. 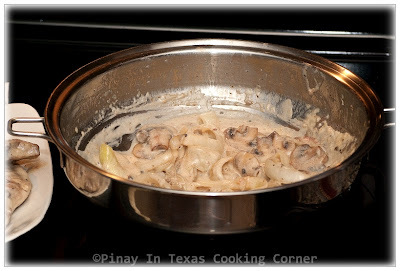 Add mushroom, onion and potatoes into the sauce. Simmer until potatoes are done. 8. Pour mixture onto the pork chops. Garnish with parsley flakes. Serve with steamed rice. It's great to see another great variation of the cream of mushroom soup. This looks delicious :) Thanks for sharing. Have a great weekend. You never fail to entice me with the addition of mushrooms to your dishes! The pork chops are amazing. Wish I had seen this a few days ago! We did have pork chops and they were just so so. This recipe does look delicious and I really like the cream of mushroom soup idea-yum. Enjoy the weekend! 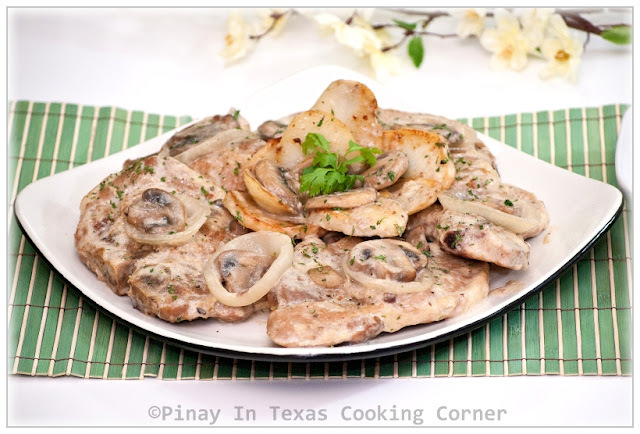 I love pork chops and mushrooms! Yum! Your pictures always look delish1 Have a great weekend! This looks wonderful. Great meal. I could eat any dish with mushrooms everyday and won't complain hahaha And the way you made this dish , I bet it taste very delicious ! I'm sure the 2 girls really enjoyed it ;D Have a fantastic weekend , Tina ! Oh, it looks yummy! And I did a mistake, I saw mushrooms in a shop today but decided not to get them since I didn't have any recipes.. Perfect recipe to celebrate Valentine's day with loved ones. I never dine out on Valentine's Day even if it falls on weekends. Prices are so exorbitant, crowded, slow service etc etc and cannot take away the comfort of enjoying a wonderful meal at home. Looks great! Even though I dont eat mushrooms, this dish looks tempting! Super recipe! I'll definitely try it! Thanks! My wife made this for me when we first met years ago. Simple, but as the years passed, she realized that I was the better cook so she finally surrendered the kitchen to me, her puti hubby, and all has been well in cuisine land ever since. Haven't made this for a long time, but might give it a try again. Wife has asked me to cook more Filiipino dishes..lwhich is fine but heck! Gotta do it with some health considerations! That sounds absolutely yummy. Thank you very much ! !